Customs agents have sealed a senator’s house in Kano where they also impounded13 Toyota Hilux vans and a Land Cruiser Jeep suspected to have been smuggled into the country. Officials of the Nigerian Customs’ Comptroller General Special Compliance Task Force carried out the operation yesterday. The house is said to belong to Senator Barau Jibril, but the Senator could not be reached for comment yesterday. All calls put to his mobile phone by our reporter could not go through nor did he reply to text messages. Leader of the special task force, Chief Superintendent of Custom, Bala Dole, confirmed the seizure to newsmen in Kano. A source at Customs Headquarters in Kano told Daily Trust yesterday that no one had come forward to claim ownership of the vehicles. “As I am speaking with you now, nobody has approached us to claim ownership of the vehicles. They are under our custody and the house where the cars were kept has been sealed by our men,” he said. The source said the vehicles were smuggled into Nigeria through the Maigatari border in Jigawa state. He said officials of the task force trailed the vehicles from Maigatari to the senator’s house, impounded them and sealed the house. The source added that the operation was carried out based on a tipoff. The task force also seized 210 trailers loaded with contraband goods that were smuggled into Kano and Jigawa states from the neighbouring countries. He said the goods confiscated include 97,570 bags of foreign rice and 2,916 cartons of spaghetti, 2,770 cartons of vegetable oil and 889 belts of second hand clothes. Other items are 50 belts of fairly used school bags, 110 cartons of brand new foreign shoes, 956 cartons of mosquito coil worth N269m. He said the seizure was carried out from July 2016 to date, saying the goods were smuggled into Kano, Katsina and Jigawa state through Nigeria’s borders with Niger republic and Cameroun respectively. It emerged also yesterday that the SUV bullet-proof car purchased by the Senate at N298million was bearing fake documents. The importer Tokunbo Akindele told the Senate Ethics committee investigating the matter that it was discovered in January, this year that the car carried a fake document. He said the car was not imported for Senate president, Bukola Saraki and that at the time the vehicle was imported, it was not for his use. 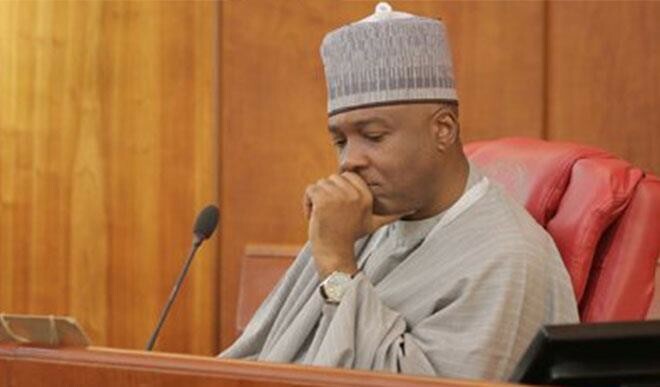 “There was no document received at the National Assembly. The clearing documents were fake, this we found out in January 2017,” he said. Chairman of the Senate Committee on Services, Senator Ibrahim Gobir (APC, Sokoto), said: “The Senate does not import cars; we buy our cars from the importer. The problem is between the dealer, the importer and the Customs”. The Chief Executive Officer of Lanre Shittu Motors, Chief Olarenwaju Shittu explained how the car was sold to the Senate. “The car was consigned to Lanre Shittu in October 2015 from Wale Tinubu, they were not able to use it for what they wanted to. Not long there was complication; we facilitated the supply to National Assembly. There was never a time we sold vehicle to Saraki. “When the vehicle had issue in January, 2017, we called Oando and documents were sent. The Customs said it was fake. We never had any document from National Assembly, “he said. The public hearing continues today with the Nigeria Customs Service. When he appeared before the Ethics committee, Saraki said the institution must continue to be strengthened to carry out its mandate, rather than strengthening individuals.